A number of Confederate soldiers are buried at this historic cemetery in Staunton. Staunton sits at the southern end of the Shenandoah Valley. The war era Central Virginia Railroad came through the town and the trains brought supplies and numerous soldiers from the Confederate States. The Confederate section of Thornrose has some 1,700 soldiers buried together while veterans who survived the war are scattered in family plots all over the verdant rolling hills. One of these veterans is my gggrandfather, Captain Edwin Anderson Fulcher. 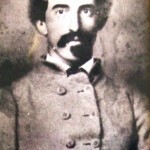 He commanded Company A, 10th Virginia Cavalry and was wounded protecting the rear of Lee’s army on the retreat from Gettysburg. After the war he lived in Staunton and worked his farm while cooking mash and bottling his own whiskey. He died in 1911. 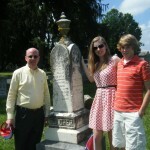 My family visited his grave on May 28 [Memorial weekend] to leave a Confederate battle flag to honor his service. This was the first time that my wife and kids had been to this spot. Our family is blessed to have a photo of Captain Fulcher at age twenty-one in his uniform.